PEMBROKE PARK, Fla. - The state of Florida is cracking down on bad actors in the professional guardianship industry, hoping the latest reform bill, signed into law by Gov. Rick Scott in March, will protect seniors from guardianship abuse. Last Friday, the Florida State Guardianship Association (FSGA) met in Fort Lauderdale for their 2016 Annual Conference, where officials discussed recently passed SB-232, based on the guardianship audits performed by the Clerk & Comptroller in Palm Beach County for the last 25 years. "Historically, the clerks have had the statutory obligation to monitor the guardianship's financial information," Clerk Sharon Bock, from the Palm Beach County Clerk & Comptroller, said. "In 2013, that was enhanced to be able to actually investigate and audit and get down really in the nitty-gritty of these files." A professional guardian appointed by the court steps in when an incapacitated person does not have a willing and qualified family member or friend to manage some or all of their delegable rights. Previously, professional guardians who were abusing their power could simply move to a different county that does not do enhanced audits in order to avoid investigation. Now that the Clerk of Courts is partnering with the Department of Elder Affairs, however, Bock said the new law fills that hole by requiring a collection of that information all in one place. "That gap has now closed," Bock said. "We will now, through our partnership with the state, be reporting the outcome of our investigations and audits." In March, a Local 10 News viewer Called Christina after he believed that his father's guardian was not acting in his best interest. James Vassallo, son of Albert Vassallo, told Local 10 that he was facing guardian fees and legal bills totaling $65,000 in just six months. He was also removed as his father's trustee, leaving guardian Elizabeth Savitt as the sole decision-maker in all of Albert's affairs, although Vassallo claimed she was not financially fit to be a guardian. "This is what you call a legal way of robbing people and they're getting away with it," Vassallo said. During the course of the months-long Call Christina investigation into the complaint about Savitt, her husband, a Palm Beach County judge, was reassigned. Florida has the largest population over the age of 65 in the country. According to the Clerk & Comptroller of Palm Beach County, there are also 50,000 people under court-controlled guardianships in the state and nearly $4 billion in guardianship assets at risk for exploitation. "There are sometimes some bad apples," Secretary Sam Verghese, from the Florida Department of Elder Affairs, said. "What we've sought to do with the legislature has been to fix some of those gaps that've been there, so that if there is someone who's being taken advantage of from abuse, neglect, exploitation, financial fraud, there's a way to actually go after the bad apples so more people aren't hurt." In creating the Office of Public and Professional Guardians (OPPG) within Department of Elder Affairs, the passing of SB-232 requires that the OPPG provide monitoring and disciplinary oversight of professional guardians, including the ability to revoke a guardian's registration. It also establishes a complaint department for families and those in guardianships, and certifies and supervises court-appointed guardians. This is in addition to HB-5, which was signed into law last year in order to make it more difficult for guardians to seize control of their wards' assets. "This in fact will stop, or we hope will deter the kind of unethical and fraudulent practices that we may have seen in the past," Bock said. If you or someone you know is having issues relating to a public or professional guardian, you can contact the OPPG's toll-free complaint line at (855)305-3030 or file a complaint online. 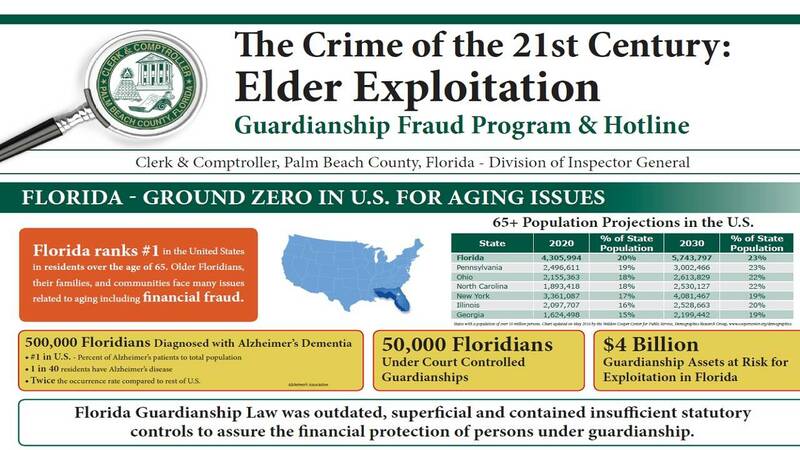 Consumers in Palm Beach County can also file a report with the Clerk & Comptroller's Guardianship Fraud Hotline. Article written by: Sara Girard, Call Christina Team Member. Follow Girard on Twitter @SaraYGirard.